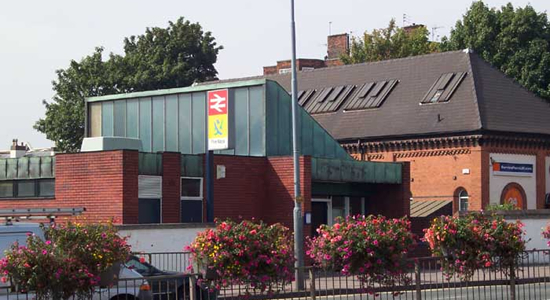 Another example of the rebirth of local rail travel, Five Ways station originally operated between 1885 - 1944 on the Midland Railway's Birmingham West Suburban Railway. 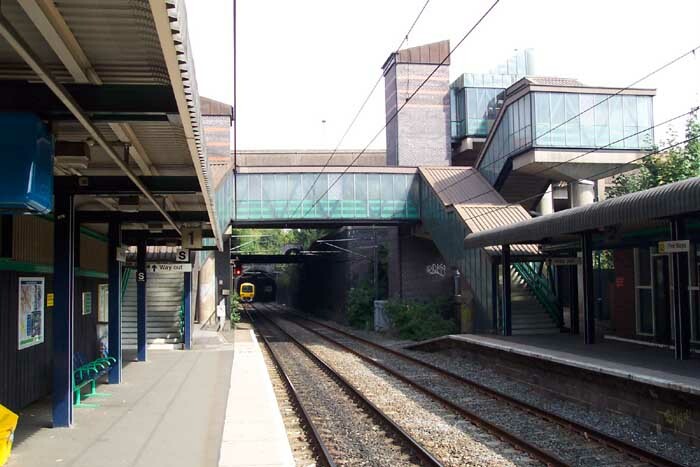 As with all but two of the stations on this line, it reopened in 1978 as part of the 'flagship' Birmingham Cross-City Line. The station building itself, as is apparent from the above picture taken in September 2003 from Islington Row Middleway, is not the original but one built for the aforementioned reopening of the line for local services between Lichfield and Redditch. From a historical perspective the station is also interesting as it was the point at which the long-defunct line to the Midland Railway's Central Goods Station left the mainline (to be totally accurate, originally the line from Five Ways to New Street didn't exist and the goods line was the passenger line to a terminus at Granville Street), traces of which can be seen below. Above-left we are on the Birmingham platform of Five Ways station looking towards the tunnel that leads to New Street Station: Islington Row Middleway runs from right-to-left just beyond the station footbridge. Above-right we are in the same spot but this time looking back towards University station or, until its closure in 1925, Church Road station which was originally next along the line heading South from Birmingham City Centre. 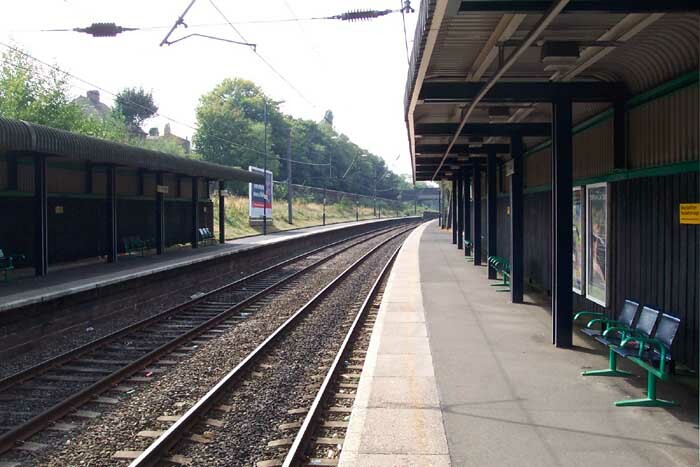 The line to Central Goods, and indeed the original trackbed for the West Suburban Line can be discerned to the centre-left of the photograph apparently climbing a steep gradient. This is somewhat misleading as the main line itself is rising at this point from New Street also. 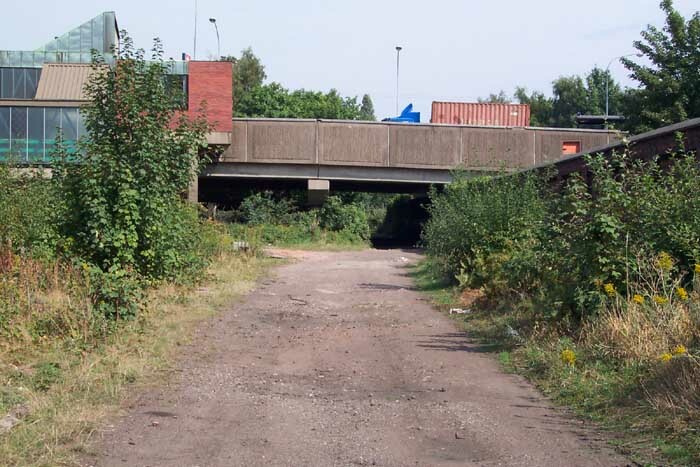 Above-left we see the view from the Islington Row Middleway bridge looking South. 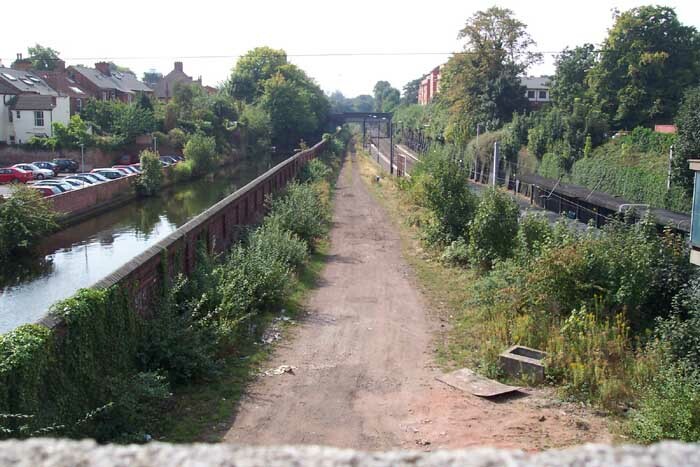 This is a good shot (even though I do say so myself) in that it shows the station and Cross-City Line to the far right, the trackbed of the Central Goods line centre, and the Birmingham-Worcester canal to the left. Above-right we are on the trackbed of the Central Goods line looking South towards the point where the lines converged just before the St James Road bridge which you can see in the distance. Above we are in the same position as the previous shot but this time looking towards the City Centre with the current station to our left. The gradient from the level of the cross-city line is quite steep at this point and one could imagine heavily-laden goods trains with a full head of steam struggling towards Central Goods. The Islington Row Middleway bridge ahead was not the original overbridge at this spot but the product of the redesigning of Birmingham City Centre during the 1960s when the large dual-carriageway ring-road system was introduced: as can be seen in the 1890 map earlier, the road was originally named Islington Row and was of much less magnitude. For more on the Central Goods line see the pages for Granville Street Station and Central Goods.